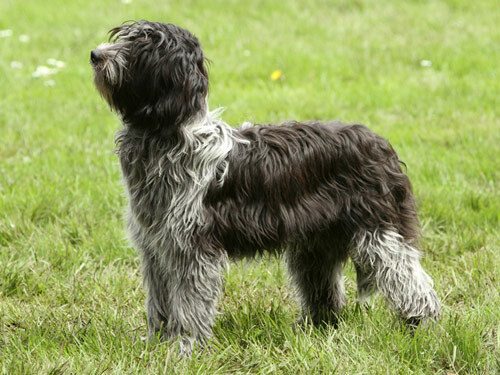 The Schapendoes has a light build which enables this breed to be very agile. They are extremely alert, brave, intelligent, and are remarkable jumpers. This hard-working breed is able to withstand any type of weather. Schapendoes have only recently become recognized as a household pet. The Schapendoes breed is very loyal, devoted, clever, and tireless. The Schapendoes possesses endurance and strength. They do well with considerate children and other pets they have been raised with. They will become vocal when they perceive trouble or danger and make good watchdogs. They are free-thinking, independent, and lively. The Schapendoes requires daily brushing of the coat. Bathing should only be done when absolutely necessary using a mild shampoo to preserve the integrity of the coat. Daily cleansing of the face is recommended. The ears and paw pads should be checked often for debris. Due to careful and selective breeding, the Schapendoes has no health issues. The Schapendoes has a self-cleaning double coat. The outer coat is wavy, long, harsh, and dense. The undercoat is thick and soft. This breed sheds little to no hair. Obedience and socialization are absolutely crucial. Schapendoes do not respond to harsh or heavy-handed methods. Training must be done with respect, praise, firmness, and consistency. The Schapendoes is not recommended for apartment or city living. They are a high energy breed that require an inordinate amount of exercise. Schapendoes do best in a rural setting and thrive on family interaction and being given a job to do.